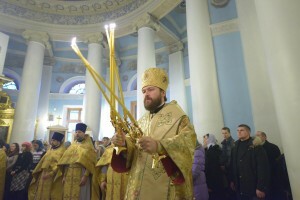 On December 29, 2013, the Sunday of the Holy Forefathers, Metropolitan Hilarion of Volokolamsk celebrated the Divine Liturgy in the Church of Our Lady the Joy to All the Afflicted-on-Bolshaya-Ordynka, Moscow. “In the name of the Father and of the Son and of the Holy Spirit! 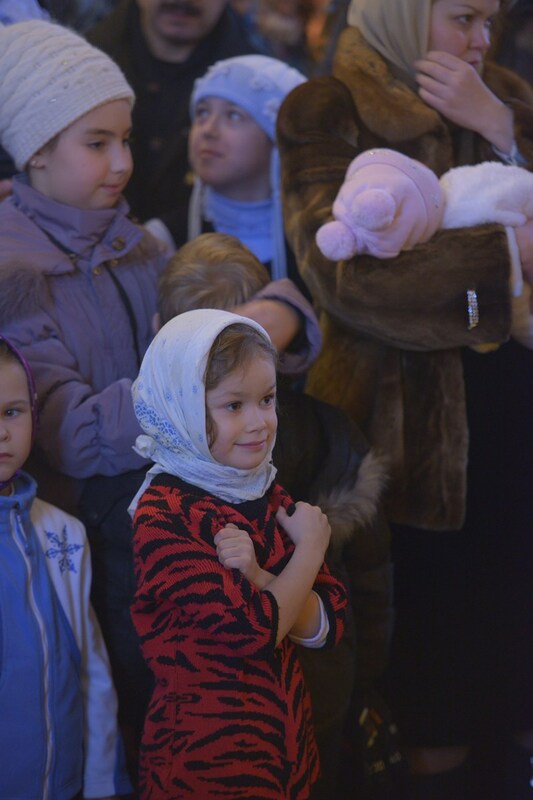 We have not so much time left before the Nativity of Christ and only two days before the New Year. Today, together with the whole Holy Church we celebrate the memory of the Lord’s ancestors, on whom God’s grace rested and about whom the Holy Scripture of the Old Testament tells us. On this Advent day before New Year, we have heard the Lord’s parable about those who were invited to a marriage feast. It is addressed to us all and each of us because we are those invited to the marriage feast, and our Lord Jesus Christ himself is the host of the supper. The marriage feast he offers is the Holy Eucharist to which he calls us on every Sunday and every feast or pre-feast day and generally every time when the Liturgy is celebrated in the church of God. But each of us has his or her own concerns and things to do. Some has much work to do, others many things to look after at home, still others some important events in life, still others are simply too lazy to get up early on Sunday even if the Liturgy begins at 10 0’clock in the morning. Very often we put off taking Holy Communion till Advent or Lent or sometime in the future as if communion is some obligation, a religious duty we are to fulfil from time to time. But Holy Communion is the core of church life. It is the core of our own spiritual life because Communion in which we are united in our body with the Body of the Lord and in our blood with the Blood of the Lord fills us with the grace-giving power we need also to fulfil our temporal professional duties and our worldly everyday obligations. The Lord has placed us in this world with all its problems and concerns but he reminds us that we should not be of this world. We live in this world but our thoughts should be in the other world because the Heavenly Kingdom which the Lord has promised to all who believe in him came close to us at the very moment when the Lord came to this world and created his Holy Church in this world. The Heavenly Kingdom is not at all a remote abstract idea or only that which awaits us or some of us beyond death. The heavenly Kingdom is that which we participate in already in this temporal life, first of all through the Eucharist in the church of God. In these days of Advent, we think in a special way about the meaning of the Nativity and about why the Lord has chosen this way of our salvation: he came to our world instead of giving us his help from afar, from a heavenly height. We are aware that all this happened because the Lord came to love his creation – the whole human race and each of us. The idea that he loves human beings and does not forsake them, that he became man for our sake and assumed the human flesh, became a helpless and frail infant and then grew up and built up in the spirit like any other enfant on earth who was born by a woman – all this makes us look and turn in our hearts to our Creator with gratitude. This divine love is manifested in all that the Holy Church offers us: in the sacrament of Baptism through which we have come into this Kingdom of God, which has come with power (cf. Mk. 9:1), in the sacrament of Confession, through which we can get rid of sins and receive forgiveness, in the sacrament of the Holy Eucharist, through which we are united with God himself spiritually, mentally and bodily, with all our infirm human nature. In all this the love of God for us, for the whole human race, is manifested. The Lord calls us to his marriage supper not because we are obliged to come to it, not because it is an obligation or a duty before him but because the sacrament of the Holy Eucharist is the best and the most beautiful thing the Lord offers us in this life. He has given us consolation and many blessings including temporal ones. But the greatest blessing and the greatest consolation the Lord gives us is the sacrament of Holy Communion. If for some reason we cannot take communion frequently and regularly, then at least during Advent and later during Lent let us try to take Holy Communion as frequently as possible. So, mystically through communion, if we take it with discerning (cf. 1 Cor.11:29), thinking about the love of God for which the Church lives and offers us the holy sacraments, let us participate in the Lord’s marriage feast, let us be participants in the Heavenly Kingdom that has not only been promised to us already here, on earth, but has already come in power and manifests itself in the life of the Church, in all her sacraments and rites, in all her liturgical texts and hymns and even in the outer appearance of each church built and adorned inside in the way that reminds us of the other world, so that icons and frescoes may be for us windows to the Kingdom of God in which the divine reality is opened to the human eye. Let us get prepared for the feast of the Nativity of Christ, remembering the love for the sake of which God came to this world. Let us get prepared to meeting Christ who is born, remembering that Christ came to this world not for abstract human masses but for saving each of us.